'I wouldn't mind going to Llandrindod Wells' he said. 'I went there about 30 years ago and thought it was really nice'. 'OK', I replied innocently, trying not to laugh, 'Let's do that then'. 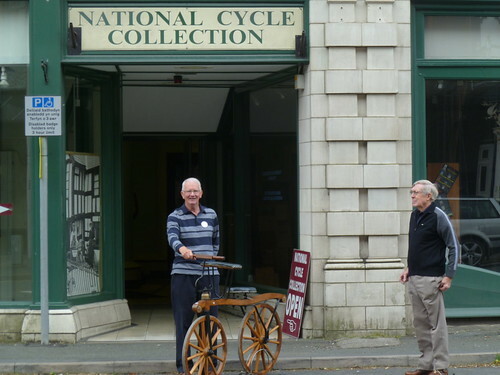 I waited until he'd booked the hotel before I confessed that Llandrindod Wells just happens to be the home of the National Cycle Collection which I'd long fancied visiting! Shortly before we set off I made another discovery – the Tour of Britain would pass through Llandrindod Wells the day after we arrived! I am entirely innocent on this one, I really didn't know about it until a few days before we went. Somehow though, I don't think Dennis believes me! By another happy coincidence our hotel was only 100 yards from the museum and so we arrived just as the doors opened. The museum is staffed by enthusiastic volunteers who took us on a brief tour and pointed out the most significant exhibits before leaving us to wander round by ourselves. 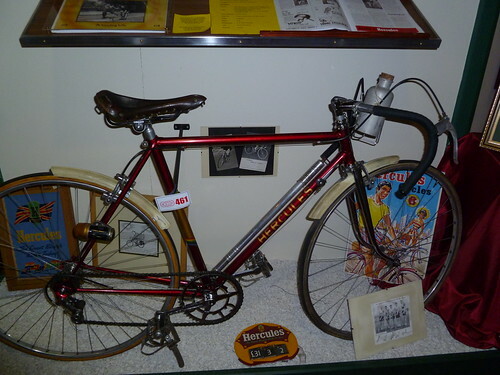 The first section is devoted to the older machines from the first Draysienne or hobby horse without pedals, through the elegant Ordinaries and onto the more familiar looking Safety Bicycles. Around the corner was what they called the 'Clubman's Section' with lightweight bikes from the 1920s right up until Chris Boardman's record breaking machine. 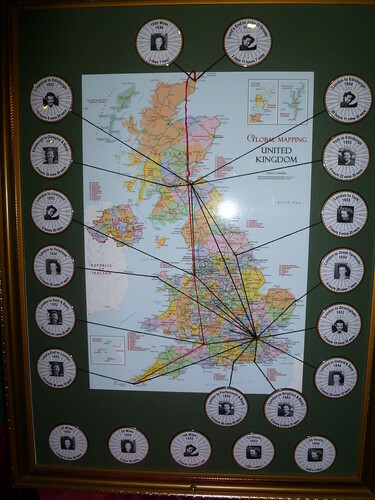 Once the conducted tour was over I immediately dived into the 'Clubman's Section'. Dennis headed straight for the nearest chair – he was anticipating a long wait! Unfortunately for him this was not any old chair but the memorial chair for 'Owd Tom' Hughes, the founder of the Autumn Tints and so I had to boot him out of it and into another nearby! 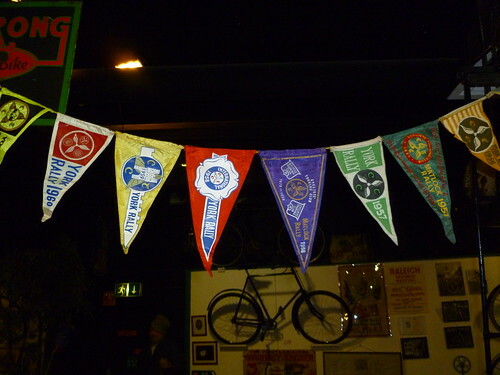 There were not just bikes but also a large collection of cycling ephemera, badges, trophies, signs, advertising material and a splendid collection of oil and carbide lamps. Here are a few pictures of items that particularly took my fancy. 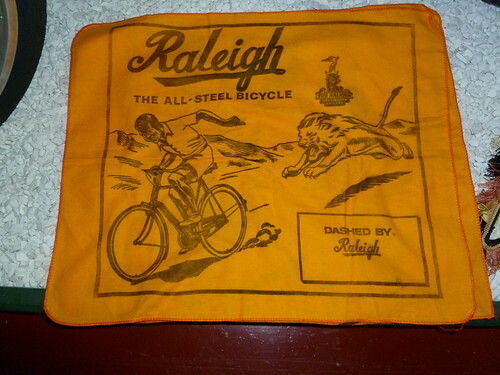 Raleigh promotional duster – what an image! 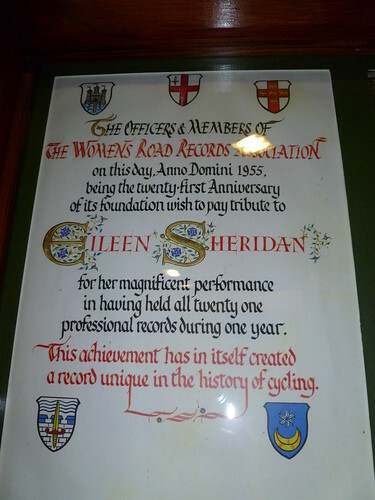 Another exhibit of great interest to me was that devoted to Eileen Sheridan, one of the greatest ever women cyclists. Her bike looked as though it would fit me nicely, I don't think I could pedal it quite so far and fast though! My final picture may seem a little macabre but I found it fascinating. 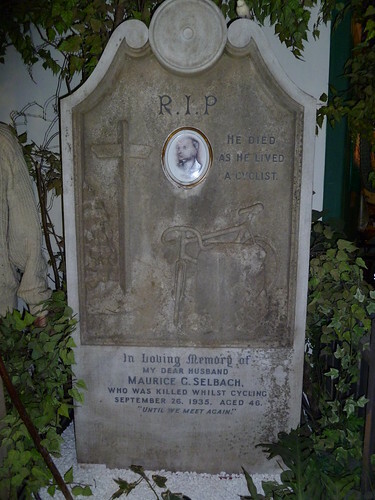 Maurice Selbach was a top class time triallist who became the first Briton to compete in a major continental road race when he rode the Paris – Roubaix. 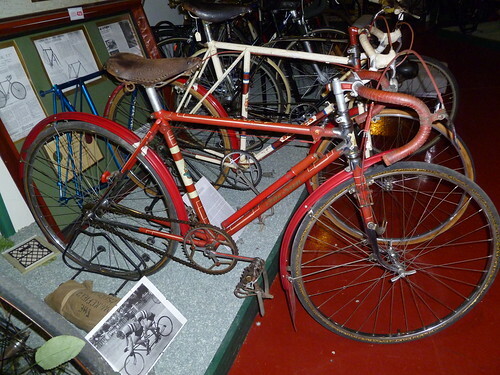 In the 1920s he set up as a bike builder producing first class innovative frames. He died in a cycling accident in 1935 when his wheel caught in a tramline and was buried with a splendid headstone in Streatham Cemetery. Over the years the cemetery became derelict and was cleared for development in the 1990s. As no relatives could be traced the stone was acquired by two local cyclists who donated it to the museum. Its a splendid and unique object. I could have happily stayed in the museum for hours but I had a pressing engagement – the Tour of Britain was passing the front door. The main crowds were at the other end of the town which was a sprint point but people had turned out in good numbers here too. Most had no idea what the race was, or where it was going to or from, but they were out in force to cheer on Britain's cycling stars. I watched the Tour of Britain pass through the New Forest in 2007 and frankly it was a bit of a non-event. This time there was a palpable air of excitement as the police motorbikes roared into position and the local school kids waved their Welsh flags and cheered anything that moved. The breakaway shot past with a seven minute lead over the bunch. 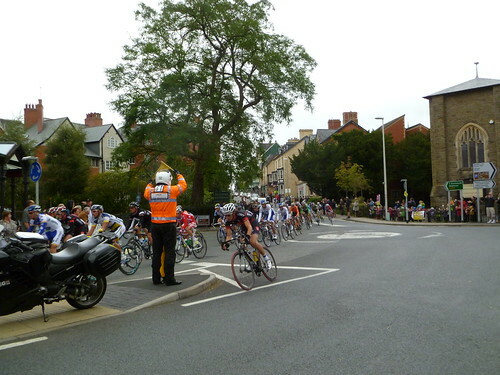 I have to admit that I didn't really see the peloton pass as I was too busy trying to take photographs! I don't think I'll be signed up as a sports photographer anytime soon – this is the best of a bad bunch. The peloton – don't blink or you'll miss it! What a brilliant start to a holiday! Posted by Hilary on September 23rd, 2012. Is the man standing near Dennis in the first photo Trevor Jarvis the world famous builder of Flying Gates? That is indeed Trevor Jarvis of Flying Gate fame but the one holding the Draisienne is not Dennis! Unfortunately I didn't get chance to talk to Trevor. The Museum is a very interesting place to visit. A bit of good fortune there, Hilary. I bet there are stories of people riding hellishly long distances on painfully heavy old bikes. There's a similar sort of thing – on a smaller scale – at the Hull Streetlife Museum. I went last year, but never thought to take any photographs. I may go back again and perhaps make a note of the route taken one of the featured rides. As it happens Mrs Bailey returned this afternoon after an overnight stay in Birmingham with three other generations at a family get together. I had the chance to go, but selflessly declined to allow the others more room in the car. Later, Mrs Bailey pointed out that the Cycle Show was on in town.